An artist who often searches for the meaning of life and deeply inclined with his self truth is Nizar Kamal Ariffin. 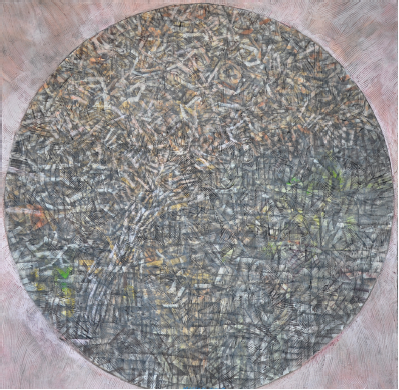 Sejambak Aman #6 is one of his depictions of the energy and passion channelled and transformed into art. The acrylic on canvas artwork shows his talent in fusing the colours to ignite the feeling of peace through his intricate brush technique. The lines signify spirituality, liberty, faith and personal growth, and as one can see, they are all interwoven and connected in the world (the canvas). Despite the state that the lines are in, a thick line is present in the midst of all the chaos, one that Nizar Kamal Ariffin defines as a line that “embodies one’s faith in the Creator to guide one through the good and bad of life”. Other times, it may represent the ruler of a country or a district, those who are responsible for leading other people. The lighter space in this piece signifies balance in life, and contextually, it means that we need faith to have balance in life.